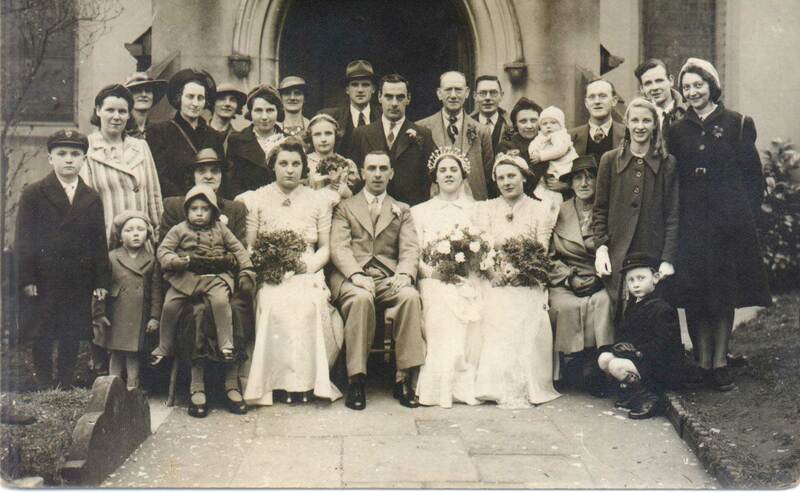 When I first got my hands on this photograph it had no helpful annotation on the back to tell me who the people were. The photo is part of my grandmother’s collection, so I could recognise her and my grandfather. As they died many years ago, I could not ask them to identify the other people. 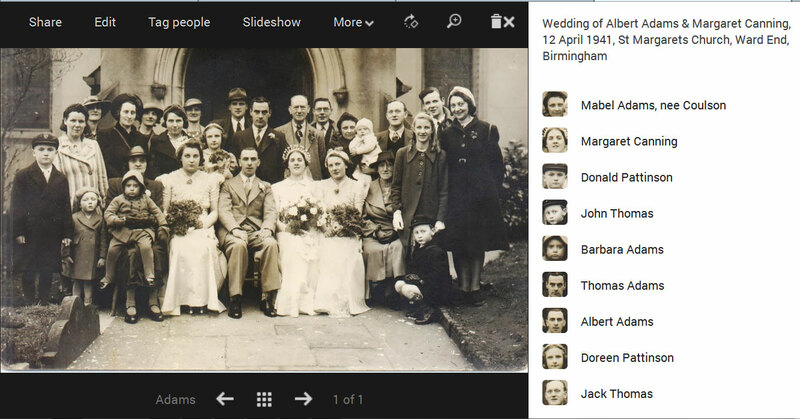 Three people of the next generation, the baby in his mother’s arms, the toddler on her grandmother’s knee and the child bridesmaid are still alive and all recognise the groom as a favourite: Uncle Albert. Although some of the people in this picture have been identified, others have not. First, I want to do the electronic equivalent of writing on the back, and second, I want to share the photo with relatives and let them add to the annotation. It is important that my annotations are embedded in the image file and that they are not lost when the file is copied or edited. Two commonly used file types that support embedded text are jpeg and tiff, which also support information like camera settings, date and time of creation, and copyright. Rather than describe the positions of people, which can get cumbersome, I want to point to a face and label it with the person’s name. Digital cameras, social media and image processing software now commonly boast ‘face recognition’ capabilities. Two processes are often conflated when people talk about face recognition. The first is the ability to determine that a face is part of the picture, rather than some other object with similar dimensions (e.g. a ball, balloon). This problem has been solved and successfully implemented in many cameras and software, which identify the part of the picture containing a face and highlight the region in a rectangle. The second problem, the ability to compare two faces and determine whether the same person is depicted, is much more complex and difficult. Automatic comparison and identification requires multiple images to train the software to recognise a person. The training is done by a person. People are talented at recognising other people, computers aren’t. All the embedded information, the file’s metadata, is the needed for the person labelling functions I want to work. Two image processing programs, Picasa 3.9 (free) and Photoshop Elements 8 (came bundled with some hardware) installed on my computer, are both capable of identifying face regions and labelling them. However, faces labelled in one program are not recognised by the other. There are many ways labels, tags and definition of face regions can be implemented by software, so programs have developed a variety of different solutions. Incompatibility between programs is a consequence. Consumer dissatisfaction prompted a consortium of digital media companies, The Metadata Working Group, to publish technical guidelines in November 2010, aimed at overcoming the incompatibilities. Photoshop Elements 8, released in 2009, does not seem to store face regions in the image file. Photoshop Elements is now on version 11, so it might have implemented the metadata guidelines. Picasa 3.9, the current version, does store face regions in the file metadata, but they are not recognised by Photoshop 8. Face regions are stored separately from tags. Tags are widely used to facilitate searching files containing tag labels. 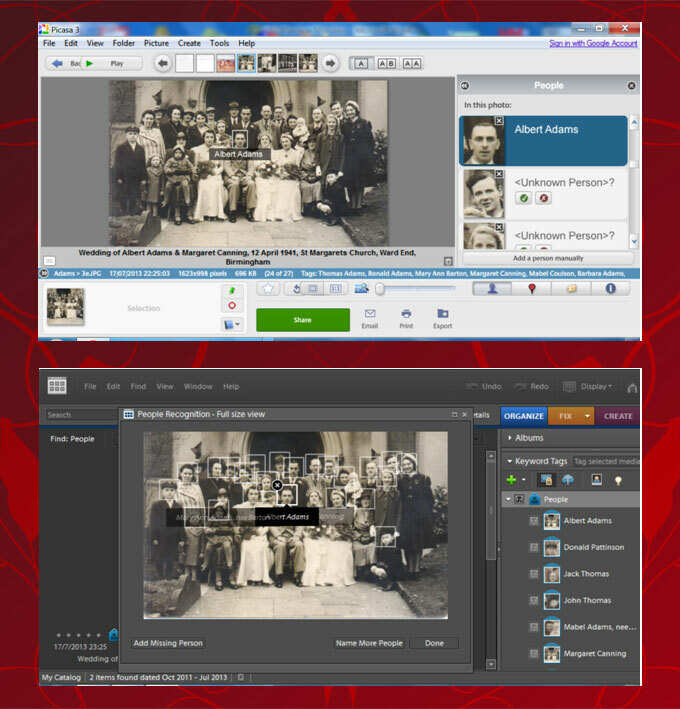 For example, photos depicting Albert tagged as ‘Albert Adams’, can be found from my operating system or image software. Photoshop created tags as I labelled face regions, but Picasa did not. It turns out I want both. For now, I prefer using Picasa for naming people as it is more user-friendly, but use Photoshop for other image editing tasks. I would like to share this photo online in a way that allows fellow genealogists or relatives to tag the unidentified people. Social media sites such as Facebook and Google+ have face region and tagging capabilities. However, only people with whom you are associated on the website can be tagged for reasons of online privacy and social etiquette. Most of the people in this photo are long dead and certainly not on social media! So, dear relatives, can you identify any of the people not yet tagged? If JPEG were being defined today then it would have been done differently Sue. It’s a rather loose standard and that has resulted in implementation variations where the meta-data is put in different places. Abode had a good try at rationalising this with their XMP. Not only could that be inserted into JPEG data but also TIFF and a variety of other formats. It was also RDF-based and so was significant to the Semantic Web. It now has an ISO designation but the retention of the Adobe trademark on the name seems to have put people off. This is an important topic but commercial self-interests, poor standards, and a lack of cohesion has resulted in a complete “dog’s dinner”. It’s a little like genealogical data really. Great article. I’ve been thinking a bit about photo metadata too, but concentrating on imprecision – especially imprecise dates. Earlier in the year I came up with a proposal, including a way people can start encoding imprecise dates as tags right now. Imprecision and unreliability are features of historical data, which makes genealogy the ultimate science of imprecision ;-). A standardised set of tags relevant to genealogy could be a way forward. If you can come up with definitions, perhaps you would consider contributing to the Family History Information Standards Organisation (FHISO) call for papers. There’s a difference between imprecision and granularity in this field. Saying that a photo was taken in 1942/1943 is a case of imprecision but when talking about ’19th century newspapers’ then that’s a case of granularity. Vital records typically have a granularity of one day but that’s not always the case. The GRO index in England & Wales groups entries by yearly quarter – something that the ISO standard doesn’t accommodate at all. The ISO 8601 standard is largely the result of an amalgamation of previous standards and so isn’t very consistent. Much of it gets ignored in favour of the pure representation of a Gregorian date or date-time, and that includes ranges, ordinal dates, etc. If you consider dates & date-times by themselves then the standard is good in that they can be sorted with a simple textual sort, and without having to decompose the dates into separate fields. This breaks down for all those peripheral parts of the standard though. You might be interested in http://www.parallaxview.co/familyhistorydata/research-notes/dates-calendars#DateValue which is different tack that tries to accommodate other granularity, sorting, and non-Gregorian calendars too. Can you please contact me via email about the similarity of someone in your photo to one of mine. I’ve emailed as requested. Intrigued.